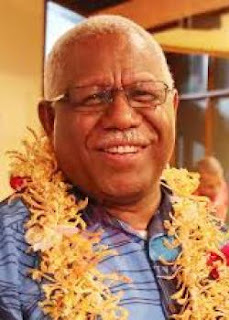 Despite Solomon Islands precarious financial situation, the Government forked out $2.7 million (US$336,000) to pay for Prime Minister Ricky Hou and his delegation to the recent APEC summit in Papua New Guinea. Chairman of the Public Account Committee and East Honiara MP, Douglas Ete, revealed this yesterday in parliament in his deliberation on the 2018 Supplementary Appropriation (No.2) 2018, Wednesday. Prior to his APEC travel, Hou defended his decision to adjourn parliament so he could attend the summit. Although Solomon Islands is not a member of APEC (Asia Pacific Economic Cooperation) Hou decided to attend as a member of the Pacific Islands Forum and an observer. He said APEC was an important meeting for the region, and that Pacific leaders had been invited to attend by Papua New Guinea's prime minister. But the chairman for Bills and Legislative Committee and Member of Parliament for Aoke/Langalanga, Mathew Wale said while the meeting is important, a balance must be made. “In the face of the existential threats to many communities in our country where is the sense of priority?” Wale asked. “And in this particular matter where is the sense of emergency? It’s our people who are in a desperate situation here,” Wale told parliament. Meanwhile, critics say since coming into power late last year, Prime Minister Hou seemed to spend most of his time travelling abroad. “Calculate the costs of these trips and you can see how much money the country has spent on the PM’s overseas travel. “The country’s health sector is suffering and it’s going from bad to worse and yet our prime minister and his government can still see it fit to travel overseas and spent millions of dollars that should be used to address issues within the country,” one critic said. “While some overseas trips are necessary, consideration should be given to the precarious state of government finances. “No one knows this better than Hou, who has an economic background.”.